Market: STI recovered in September with a modest 1.4% gain. 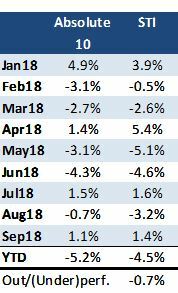 YTD, it has returned a negative 4.3%. The rift between the U.S. and China is not limited to trade. It has spilled over to politics. Trump may realise it is not easy to pick a fight with someone your own size. Other pressure points are needed. To this end, the tone and rhetoric of the U.S. administration has intensified in recent weeks. The first salvo was fired by Vice President Mike Pence, accusing China of economic aggression, interference in US 2018 mid-term elections, stealing U.S. technology, intimidating neighbours, militarizing the South China Sea and religious persecution. In recent NAFTA (or USMCA) trade talks, a condition was also inserted that no member country can ink trade agreements with a non-market economy (we know who) without approval from the other member countries. More worrisome was an incident in the South China Sea in which a Chinese destroyer nearly clipped another U.S. Navy destroyer. Adding fuel to the fire were allegations by Bloomberg of Chinese spying from tiny microchips at data-centre equipment, based on their “anonymous” source(s). Tensions with China are unlikely to abate anytime soon. China hawks Navarro (trade adviser) and Bolton (national security adviser) remain pivotal members of the Trump administration. But why all the hostility now? In part, we think Trump is seeking to beef up his credentials as a protector of jobs for Americans. Another more plausible reason is China’s “Made in China 2025” strategic plan. Unveiled in 2015, this is a 10-year strategy to escape the middle-income trap and emerge a powerful manufacturing country. China will raise domestic content to 70% in 10 targeted industries. It will manufacture its own semiconductors, medicines and planes. From a U.S. multinationals’ perspective, China has officially declared itself a competitor. It is no longer a customer or market for US products. Predictably, the multinationals will be more open to their governments’ attempts to slow down the progress of any competitor. Recommendation: We have downgraded our STI target from 3700 to 3400. The backdrop for equities is not positive. Global economic growth has peaked, interest rates are inching higher and we have a new cold war. Furthermore, we expect caution as we head towards U.S. mid-term elections. A loss of the Lower House for the Republican Party would mean more investigations of the President. Despite their tacit support, Democrats are unlikely to approve an infrastructure spending bill that could boost Trump’s popularity. In Singapore, we still favour banks. Interest rates are rising and loan volumes, still healthy. A negative will be soft capital markets. This could hurt wealth-management income as risk-averse customers turn to lower-margin products. A stock that has become more appealing to us is SembCorp Industries. Almost all its businesses are perking up. India is enjoying a rebound in spot electricity prices. This augurs well for profits and increases the likelihood of securing long-term PPAs. Electricity demand in China is better than expected. Integrated energy operations in Jurong have shielded the company from depressing electricity spark spreads in spot markets. Expansion into renewables and rapid-response power plants should also fuel mid-term growth. As for its marine segment, it has been de-rated to fairly low expectations. Source: Bloomberg, PSR. Phillip Absolute 10 performance assumes equal weight to every stock in the portfolio. Any change to Phillip portfolio is only conducted at month end. Performance of the portfolio and STI does not take into account gains from dividends. Our inaugural Phillip Absolute 10 Model portfolio began in January. It started well with a rise of 4.9% in January. Banyan Tree and CapitaLand led gains in January. DBS has been a significant contributor to our performance with a gain of 15% for the period of Jan-Feb18. We then switched to OCBC in March due to the higher upside to our target price and a beneficiary of higher interest rates (in particular through insurance business). In July we swapped out Asian PayTV, Dairy Farm and OCBC, with CapitaLand Commercial Trust, Sheng Siong and DBS. In September, our gains could not match the STI. Our largest gainers were Geo Energy, ComfortDelgro and DBS Group. Transportation stats continue to support the reduced supply of private hire vehicles and the taxi fleet has started to recover, albeit modestly. Geo was helped by an announcement to dual list in Hong Kong. 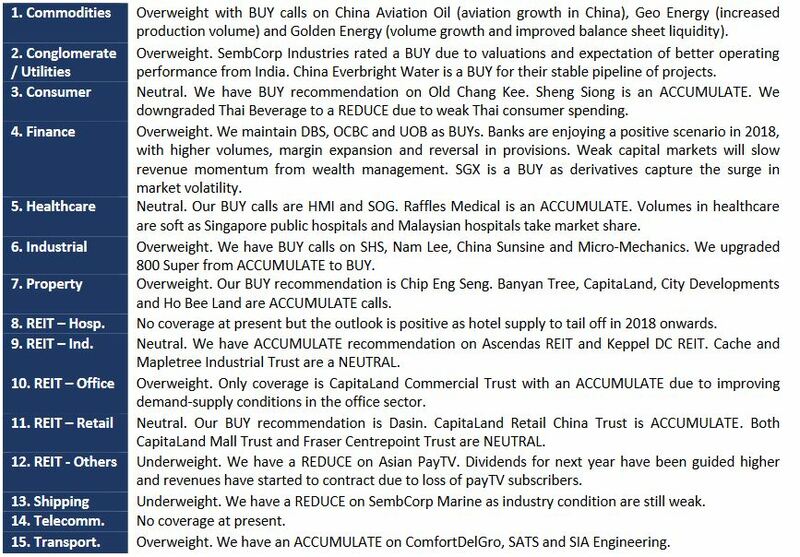 Weakness was in Sheng Siong, Ascendas REIT and CapitaLand. We are still comfortable with our portfolio and no changes will be made. Sheng Siong is undergoing some profit taking after some stellar gains. We expect strong earnings from the company as gross margins pick up from higher contribution of fresh food and sales expands with new store openings Ascendas REIT share price was hurt by a share placement. We still like Ascendas for it diversified portfolio of more than 100 properties. It will also enjoy pick-up in rental for the business parks as office rentals in the core central region continue to climb. 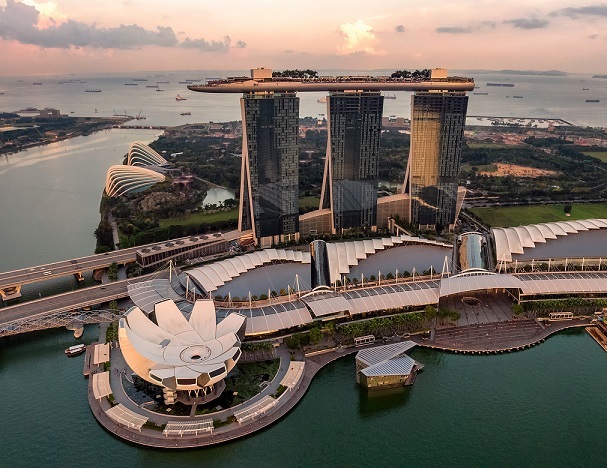 New investments into Singapore will favour their high-spec buildings. CapitaLand is pulled down by the expected weakness in property sales as new cooling measures were rolled-out. 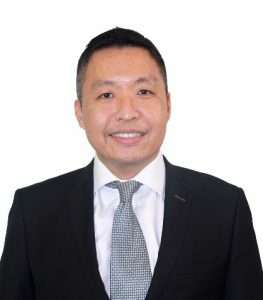 We like CapitaLand emphasis on building up its recurrent revenue base as it seek higher quality income with better ROEs from an asset-light model. Best performing sectors in Sep18 were Shipping, Industrial and Consumer. Shipping benefited from 15.9% jump in Yangzijiang and 21% rally in Sembcorp Marine. In Industrial, 800 Super (+20.5%) and ST Engineering (+6.6%) took the lead in gainers. Consumer benefited from gains in Thai Beverage (+9.7%), Best World (+17.6%) and SPH (+2.5%). Worst performing sectors in Sep18 were REIT-Industrial, Property and REIT-Others. REIT-Industrial lost groud due to losses in Ascendas REIT and Mapletree Logistics. Property suffered from losses in Hong Kong Land, OUE and Guocoland. Weakness in REIT-Others was due to declines in Asian PayTV (-11%), Accordia Golf (-3.5%) and Manulife US (-4.2%).